How does dairy farming in America’s Deep South compare to the UK? Dairy farming in the USA faces many of the same challenges as the UK. Emily Ashworth talks to Will Gilmer, who runs a family dairy farm between the small towns of Vernon and Sulligent, north west Alabama, in America’s Deep South. Will Gilmer’s family has been farming in the community around Vernon and Sulligent for nearly 200 years, with his grandfather, Gray, building the dairy in the 1950s. It is dedication to the family tradition which has seen the farm succeed, yet there are decisions to make about the future of the family business and whether or not the dairy sector is a financially secure option for the Gilmers’ to continue in. Covering about 263 hectares (650 acres), Will and his father, David, own half the property and lease the remainder from his siblings. They also lease an additional 61ha (150 acres) in the area for forage production. The land is split between permanent pasture and forage production, and they run 225 Holstein cows and an additional 175 replacement heifers. Will says: “Milk and cattle sales account for all of our farm income. “All of the crops we grow – the silage corn, hay and small grains – are harvested and used to feed our cattle. In addition to the silage, we add either Bermuda grass hay or rye-grass/oat haylage as well as a commercial custom-formulated feed. Located five miles from the nearest town in the rolling hills of rural north west Alabama, most of the fields are terraced to help prevent soil erosion and many pastures contain both native hardwood trees, or planted pine trees to provide cover for the cattle. All of the structures on the farm, from the barns and sheds to the house, range from 10 to 50 years old. The cows are milked twice-a-day by Will and his father using Germania Model B parlour equipment that is roughly 25 years old. But there are growing concerns about prices and how to survive in what is currently a volatile market. “The most immediate problems facing the American dairy industry are related to production outpacing demand which is, in turn, depressing prices,” says Will. “While there is a growing demand for certain dairy foods such as cheese and butter, per capita demand for fluid milk has been in long decline and we have not competed effectively enough in the export market to make up the difference. “Quite a few farms that ship directly to processors are having their contracts terminated due to the oversupply, and more are culling significant numbers of their cows to help minimise their losses. Heat stress is also a major issue in the Deep South and it has a significantly negative impact on conception rates during the summer months. For that reason, the family farm does most of its breeding between October and May, which corresponds with a calving season that runs from July into March. But, as in the UK, the dairy industry is under siege from misleading and disruptive activist behaviour. “I know of very few instances of direct attacks on dairy farms or facilities by animal or environmental rights groups, but they do actively campaign against us on social media,” says Will. “There have also been several cases of undercover activists gaining employment on farms and videoing incidents of abuse, many of which have been staged or selectively edited. 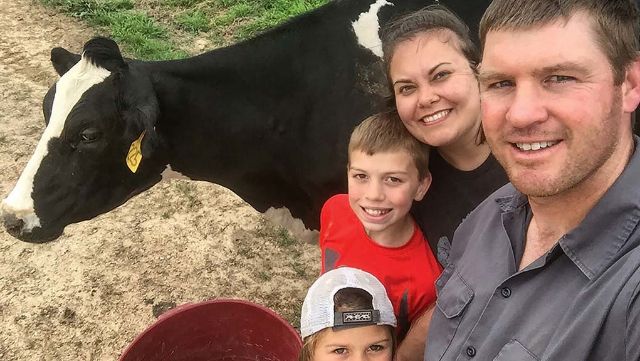 Will’s family operates the only remaining dairy in the Lamar county, and is joined by one poultry farmer, two commodity crop farmers, and a handful of beef farmers as the only people making a full-time living in production agriculture. “Specific to dairy, my region has lost many farms over the past two decades,” says Will. “In Alabama 15 years ago 125 operating dairies were licensed and today we have only 35. Neighbouring states have seen similar declines as well. The Gilmers are now taking steps to be in a position to successfully transition to raising beef instead of dairy farming, should the market no longer support dairy operations in the area, whether that be because of low margins or loss of infrastructure. Will says the economics of dairy farming and the path milk takes from farm to table are probably slightly different between the American and British industries. Their milk is put on to a transport trailer every two days and hauled to a milk processing plant. “The plant is 100 miles from our farm and ours is only the second of several farms on that transport’s route, so it actually travels a bit further before it finally reaches the plant,” says Will. Most of the milk produced in the south eastern region of the United States is bottled by major food companies or grocery chains, but Gilmer farm’s milk is marketed through a cooperative that has supply contracts with several of these companies, so may be bottled under a number of different labels. “We definitely share the same commitment to stewardship and quality, and to some degree the same climate,” says Will. “Average winter temperatures are about -1degC and summer highs average 32degC, though high humidity can push that to 37degC." Though Will says he could have pursued many other careers and have had opportunities to take jobs in the city that offered higher pay for fewer hours, he has no desire to leave. “I feel that farming is my calling,” says Will.